Build the Cisco-powered enterprise network you need with a foundation of Catalyst 4500 series switches. Power, versatility, security and reliability are just a few of the reasons why they’ve become the most widely used modular platform for campus access and distribution deployments. The Cisco C4500 series switches include six different chassis and seven supervisor options to help you match your exact need to the perfect switch. All of the options available to you provide a significant set of Catalyst benefits. Cisco network architecture gives you a digital-ready deployment that can work at the edge of your network and push right to where your applications are housed. Modular access switching capabilities make even used Cisco C4500s able to reliably scale to meet your growth demands. Models support up to 928 Gbps of bandwidth and can provide up to 9000W through Power-over-Ethernet ports. Bridge your wireless and wired access through smart, built-in controllers that extend common wired network features to your wireless deployments. Boost your network’s quality and deliver a consistent, enjoyable user experience even as your business continues to expand. 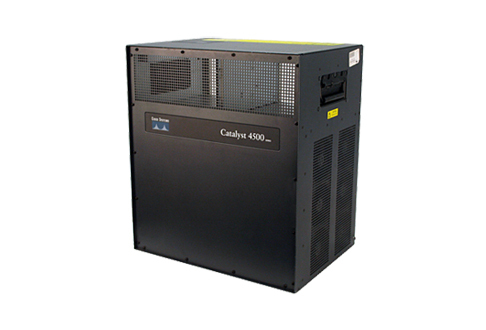 Worldwide Supply carries a variety of refurbished Cisco C4500 models that can be customized to address your specific needs. All of the products we provide have been thoroughly reviewed by our certified experts and have reached like-new status. Each used Cisco C4500 comes with a lifetime warranty so you know they’re as reliable as a new model right from Cisco, but at a significant savings off the OEM price. Expanding too fast or need a different enterprise development scheme? Talk to us right now about selling your used Cisco C4500 switches and save yourself money on storage fees and higher costs due to using equipment that isn’t right for your network. Not only do the used C4500s we offer meet OEM standards and give you plenty of customization options to bring the right switch to your network, but they also present an easy path for additional savings. Every piece of equipment we sell comes with a limited lifetime warranty. We back that up with a broader third-party Cisco 4500 support program that can help keep your network up and running no matter what happens. With our Cisco maintenance program, as well as our NetGuard option covering 100 product lines from different OEMs, you’ll get access to our repair and parts network that can have replacements in any major market within 24 hours. Plus, if you’re working in our more common regions, you’ll likely be supported by a four-hour delivery window for most switches, chassis and components. Make the most of the Catalyst system with smarter customization options that move beyond the chassis and touch maintenance and ongoing support. It’s the perfect way to extend your purchase savings into a third-party Cisco 4500 support contract with savings of up to 90 percent off traditional OEM costs. Give yourself as much room to grow as possible with a reliable, efficient maintenance and repair program that specializes in keeping networking equipment alive for years after its EOL date.